Feel the power of the dark side even when you have a stuffy head with the line of Star Wars Humidifier by Emson Ultrasonic Cool Mist. The elves at Wrapped Up N U were feeling the force this holiday season with the help of the ultra cool Darth Vader 2L Humidifier. With the release of the new movie in the Star Wars saga- "The Force Awakens". Please, us it does to see all the new Star Wars items(out Yoda impression). 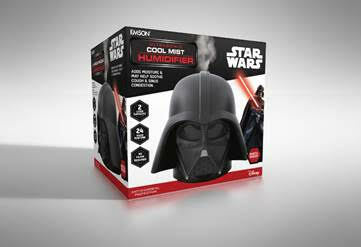 Darth Vader Humidifier ultra quiet so it won’t disturb the family for a more restful night of Star Wars dreams. We all know a restful night of sleep better prepares us to have the galaxy from evil....sorry Darth! Although, we swear while tooking at it could hear that trademark breathing...it just looks so real. There are 11 different mist settings and a mist nozzle that allow you to customize the amount of mist in the room to meet your needs. But not to worry, this ultrasonic cool mist humidifier has antimicrobial technology that will keep your room from developing mold and mildew. This can be a very common when using a humidifier for an extended period of time. 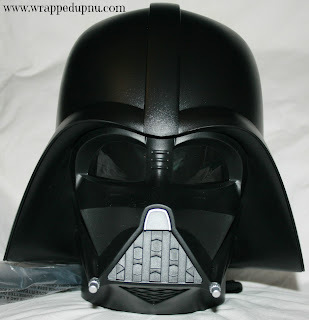 The Darth Vader humidifier has a large capasity 1 gallon water tank for extended use and less filling. But it now at Emson Ultrasonic Cool Mist. It is also available at Kohl’s, Target, Best Buy, Bed Bath & Beyond, Walmart, Amazon, K-mart, Sears, and other retailers near you. The Ultrasonic Cool Mist Humidifier adds moisture to any room and may help soothe cough and sinus congestion. There is no filter required and it features anti-microbial protection. The units are whisper silent with adjustable mist output and an auto-off function. Each unit ordered today will come with Free shipping! Sales tax will be applied to orders from CA, NJ, NV and NY.